ตัวกระจายแสงแฟลชแบบพกพา น้ำหนักเบาเพียง 150 กรัม ใช้ได้กับแฟลชทุกรุ่น ทำจากวัสดุอย่างดี ขนาด 21.5cm x 15.5cm x 15.5cm มี Mounting Strap สามารถถอดเก็บได้อย่างง่ายดาย พกพาสะดวก พับเก็บบางแค่ 1 ซม. 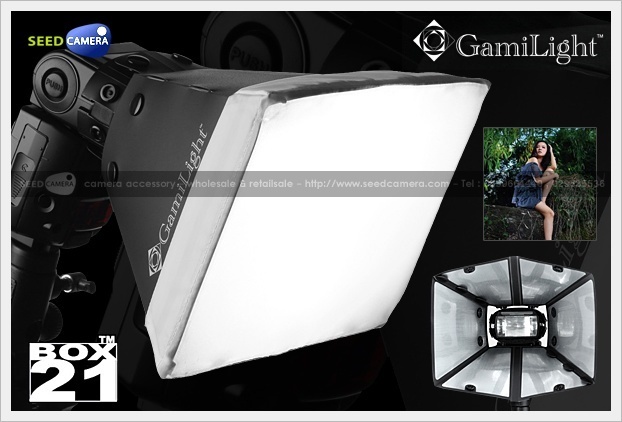 GamiLight Box 21, a smaller version of Square 43, diffuses light with the flash in the direct flash position. The light hits on the fabric diffuser and bounces back onto the highly reflective silver panels to generate a powerful light source. The light is then diffused and softened through the fabric diffuser to give your subject a richer tone and nicer shadow. - This is ideal to create a softer look with nice shadow. You will find it handy for use on an individual flash for on board or off-camera usage.